1 Pez vs. 8 Sugar Daddy/Babies; Slo-Poke. I hold a special place in my heart for Slo-Pokes. They were always the "roulette" prize at the Jefferson Elementary School Carnival. If you won big, you'd drag away a Slo-Poke the size of a canoe paddle. Or maybe it just looked that large to me. Candy always seemed bigger when I was a kid. I used to get really excited about Pez. And then I ate one. I hate disappointing candy. This is turning into a maudlin entry, so I'll add that I do have a Star Trek: TOS Pez collection. I just never eat from them. Sigh. Pez will win. 5 Pixy Stix vs. 4 Pop Rocks. This could be a tough one. However, I believe that Pop Rocks will win, because not only is my generation still making up for the time when Pop Rocks were cruelly snatched from our sticky hands, but they are way more exciting than Pixy Sticks. Less annoying, too. The most annoying thing about Pixy Stix is how wet the paper tubing gets during consumption, which makes the flavored Pixy dust stick to the edges of the torn-off paper. Even when you take careful steps to keep the tube from touching any part of your mouth, it still gets damp from your exhalations. So what do you do? You chase the dry spot by frenetically tearing off more and more Pixy Stix tubing, only to find that your saliva has travelled by capillary action all the way down the tube. Pop Rocks has the potential to suffer from this same problem, but the manufacturers had the foresight to coat their envelopes with something plastic-y (and probably cancer-causing), so the stickage isn't quite as bad. Also, you can always carefully disembowel the Pop Rocks envelope and lick the inner surfaces clean. Can't do that with the Pixy Stix. Pop Rocks FTW. 10 Nerds vs. 15 Bottle Caps. God, I love Bottle Caps. Bunting's right, though, the best thing about them are the cola- (and possibly root beer-?) flavored ones. I mean, I get why they have grape and orange represented, but it doesn't make them any more interesting. In fact, there's not enough cola-flavored candy out there. Someone should get on that. Meanwhile, Nerds came in a cool little box with slidey-out flaps that covered the holes. If you were mannerly, you poured your dose into your hands and smacked the handful into your mouth. If you were a rebel, you bypassed the hand completely and downed a long shot of Nerds until a particularly large Nerd jammed up the hole of egress. ["Hew." -- Bunting] Nerds also allowed you to create a Nerds recipe. You could have each flavor alone and appreciate their awesome singularity, or you could take a shot of lemon, followed by a shot of lime, and then chew everything up together. I was in heaven when they came out with cherry-cola Nerds. 1 Peeps vs. 8 Now & Later. I didn't expect all that Peep-hate in the last round, but still I ask you: can you have as much fun with Now & Laters as you can with Peeps? Can you age Now & Laters for a year to encourage a thin shell of crunchy sugar covering a chewy marshmallow interior? 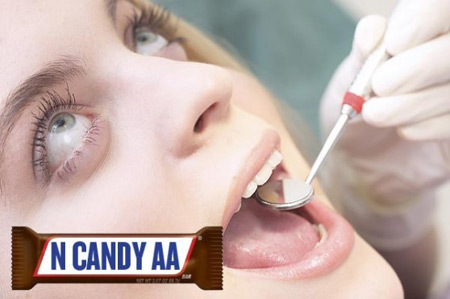 All a Now & Later can do is yank out your fillings and have delusions of Starburst grandeur. 5 Saltwater taffy vs. 4 Fun Dips. This is a match of total opposites. One candy recalls a gentler, simpler Laura Ingalls-ish era with birds singing and brooks babbling. The other recalls screaming kids bouncing off walls and getting massive sugar-crash headaches. Adult me would rather have the Laura Ingalls life. Kid me wanted the headache. Adult me loves watching how saltwater taffy is made, and still boggles over how they get those designs to make it all the way through the taffy. Elderly me would like to change "I was just yanking your chain" to "I was just pulling your taffy." Kid me has too much of a headache to put up a fight for this. Make all the grandmas in your life who still have their own teeth happy, vote for saltwater taffy. 10 Rock candy vs. 15 gobstoppers/very large round candies. I'm really shocked that rock candy made it through. I'm also really shocked how totally bored I am about this match-up. I don't have strong feelings either way here. Gobstoppers are real candy; rock candy is something cool you can use to stir your hot tea. Rock candy also reminds me of a geode's sparkly insides. Heck, I'll call it for rock candy because of the pretty.